Crowned: London (Old St Paul's) 6 January 1017. Ruled: November 1016 November 1035. also Denmark from 1018 and Norway from 1028. 19 years. Married: (1) c 1014, Elfgiva (c 996-c 1044), dau. Alfhelm, ealdorman of Northampton: 2 children; (2) July 1017, Emma, widow of Athelred II. 3 children. Died: Shaftesbury, Dorset, 12 November 1035, aged about 40. Cnut (Canute) The first Dane to be crowned as king of England. His subsequent rulership of Denmark and Norway made him the most powerful king of northern Europe. Canute had accompanied his father, Swein, on his conquest of England in 1013, when he was left in control of the Danish fleet in the north. Once his father had been elected king of England, Canute saw fit to entrench his position in the north and it was probably early in 10 1 4 that he claimed marriage to Elfgiva, the daughter of Alfhelm, who had been ealdorman of Northumbria until his murder in 1006. Swein died early in 1014 and although the Danes elected Canute as their new king, the witan chose the return Of Athelred whose forces drove Canute from the north. Canute was also concerned about establishing himself on the throne of Denmark, but by the time he had returned to his homeland his elder brother Harald was already ensconced as king. Canute returned to England late in 1015 and the next twelve months saw a wasting conflict between the Danes and the Saxons under Edmund Ironside. Neither side was the complete victor and in October 1016 Edmund and Canute divided England between them, with Canute taking Mercia and Northumbria. The following month Edmund died, many believed by the treachery of ealdorman Eadric. Canute was elected king of all England and was crowned early the following year. The records of Canute's early reign are limited and often prejudiced against him, as are most annals of a conqueror by the conquered. He comes across as a tyrannical king who systematically murdered or exiled most of the leading Saxon nobles, including those who had crossed to his side. The traitorous Eadric he had executed. However, he did not eradicate the Saxon nobility as this would serve him little purpose. England was by now a well established kingdom, whereas Denmark had only recently been united and Canute was young and untested in kingship, especially in a foreign land. He needed the support and help of those who understood England and the English. Initially he divided the land into four, granting territory to three of his earls by way of military commands, and keeping Wessex for himself However, from 1018 he appointed Godwin as earl of Wessex and it was under Canute that Godwin became the most powerful earl in England. Canute also realised he needed to be on good terms with the church and went to great lengths to establish relationships with Wulfstan, the archbishop of York, and Lyfing, archbishop of Canterbury. It was with Wulfstan that Canute later issued his law codes, based heavily on those already promulgated by the Saxon kings. Canute was able to adapt these codes for use in Denmark. Finally Canute married Athelred's widow, Emma, in order to strengthen his right to the throne. By all accounts he was still married to Elfgiva, which has caused some commentators to presume she was his mistress. She was certainly more than that, some treating her as his "handfast" or common-law wife according to Scandinavian custom, whilst Emma was his formal wife and queen. By this arrangement it meant that the children of Emma were heirs to the English throne, whilst the children of Elfgiva had right of succession to the throne of Denmark. In 1018 Canute returned to Denmark where, after the death of his brother, he was accepted as king. 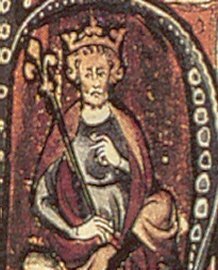 He did not return to England until 1020, but even then required regular trips to Denmark to sustain the throne, particularly during the period 1022-3. In 1020 Canute held a major council at Cirencester. There seems to have been some unrest during his absence, and Canute dealt with this by banishing Athelweard, the ealdorman of the western provinces (the former Dumnonia). The reason for his exile is unrecorded, but we can imagine he had been plotting against Canute, perhaps to restore one of Athelred's sons to the throne, the likeliest one being Edwy. Some records suggest that Edwy had been murdered by order of Canute in 1017, but William of Malmesbury records that he survived and lived in the south-west of England, perhaps under the protection of Athelweard. It may be that Edwy was murdered after Athelweard's expulsion. The next year we find Canute at odds with Thorkell the Tall, another Danish earl who had sold his services to Athelred in 1013, but who had accepted Canute's overlordship and been made earl of East Anglia. Thorkell must have challenged Canute's authority, perhaps in his treatment of the Saxons. Thorkell, for all his early devastation of England, had married a Saxon and seems to have established a friendship. He possibly had more scruples than Canute and they disagreed over Canute's policy of government. Thorkell was banished. The two became reconciled in 1023 when Canute made Thorkell the regent of Denmark and the foster-father of his son Harthacanute. Canute's reign has all the hallmarks of a powerful king who was initially uncertain in his authority. The harsh measures at the start of his reign arose through his feeling of insecurity, though he was in fact more stable in England than in Denmark. The English had suffered nearly thirty years of privations under Danish raids, and all they wanted was a restoration of peace and prosperity. The degree of support that he had in England gave him the strong base from which to consolidate his rule of Denmark and, from 1028, to conquer Norway. From 1030 he installed his eldest son, Swein (then about sixteen), as king of Norway, with his mother Elfgiva, as regent. By the mid- 1020s Canute had mellowed from his earlier tyrannical rule (which was probably exaggerated in any case by the chroniclers) to one of piety. He made considerable gifts to the church in the hoping of buying salvation for his soul. The famous (much later) story of Canute sitting in his throne on the beach and commanding the tide to turn may have an element of truth. Although the legend suggests that Canute wanted to demonstrate his authority over the waves - and by implication his power over the northern seas - the fact is that Canute was giving a demonstration of piety by proving that he did not have power over them. The event is traditionally sited at Bosham on the English south coast, but an earlier record, by Geoffrey Gaimar, does not refer to Canute's throne and places the episode in the Thames estuary. In 1027 Canute visited Rome and attended the coronation of the Emperor Conrad 11 whose son, Heinrich, would marry Canute's daughter Gunhilda in 1036. Canute visited Rome again in 1031. Nevertheless, despite his piety, Canute sought to impose his authority not just over England but Scotland and Wales. He visited Scotland in 1031, probably not with an army of conquest, but in order to form a peace alliance with Malcolm ll who had taken advantage of unrest in England during Athelred's reign to impose his authority over Bernicia and parts of Northumbria. The agreement reached between Canute and Malcolm saw Bernicia restored to England and the English Scottish border established more or less as it is today. The ASC records that three kings submitted to Canute in the north. In addition to Malcolm these were Maelboeth, who was almost certainly Macbeth, and Lehmarc, who was probably Margad Ragnallson, the Norse king of Dublin who had authority over Man and the Isles. Thorfinn the Mighty, earl of Orkney, was already subject to Canute as his Norse overlord. Canute's authority over Wales was more tenuous. There is some suggestion that Rhydderch Apiestyn recognized Canute's authority, but that may have been an administrative convenience, judging from Rhydderch's love of power, and it is unlikely that Canute exerted any power in Wales. The records and later folklore suggest that Canute came to love England, possibly more than his homeland. He was a monarch who had conquered and established the most powerful of all Scandinavian empires, and through his power and authority was recognized as one of the most important rulers of his day. He died remarkably young, aged about forty. There is evidence that he knew he was dying and had a terminal illness that lasted for many months. Yet his death must have come suddenly as Harthacanute, who should have been his successor, was in Denmark and unable to stake his claim on England. Canute was therefore succeeded by his younger (and possibility illegitimate) son Harold (I).